Early this afternoon (or early this evening as in my case), Tokyopop held its first webinar: a live webcam-based session where Tokyopop staff took the time to share some information about upcoming titles and answer a whole lot of questions from the attendees. Thanks to a quick transit home, I was able to attend this first-of-two sessions and you can read about what was said under the post cut. As for my impressions of the Webinar as a whole: fantastic idea. It allows the opportunity for a convention-type industry panel but that people around the world can join in on from the comfort of their own homes. It’s a great way to communicate with fans and I give Tokyopop major kudos for putting it into place. Most impressively was the number of questions they were able to answer thanks to the in-order, streamlined method of submission. Very organized and a great opportunity to hit a lot of proverbial birds with one stone (I had all my questions answered so that was snazzy). I certainly hope I can attend the next one as well. Tokyopop hasn’t had an official industry panel since Anime Expo 2008 so this webinar was a welcome sight to press, fans and Tokyopop alike. The webinar will be two parts because of the sheer volume of information to be delivered and to allow more time for questions. The first portion of the panel was about some upcoming releases, including new series and returning volumes of series put on hold during TP’s restructuring last year. The Domo book, a collection of short stories by multiple artists, will be full colour and, as with Tokyopop’s other full colour graphic novels, be a larger cut size than their manga properties. It has a shorter page count than the average and is aimed more predominantly at the children’s market though still has lots to enjoy for anime/manga fans who know of Domo’s popularity overseas. D.N. Angel returns after a lengthy hiatus. Volume 11 was released in August 2006. This newest volume of Chibi Vampire will include some bonus material including never before seen art and an interview with the creator. This series sounds really amusing. It’s about a girl who has a phobia of men so she attends an all girl’s school looking for the perfect yuri-girlfriend. 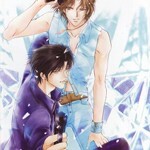 She ends up falling in love at first sight with a beautiful young woman… who turns out to be a crossdressing young man. Presumably hilarity ensues. Mikansei No. 1 – Majiko! Story of a girl who is a masochist (M), and a guy who is a narcissist (N). She seems to love feeling pain while he wears glasses to constantly being compelled to press his face against glass to stare at own reflection. …and the two become romantically involved. This one is a definitely a must-see for fun, odd-sounding plot. Haru Hana is the story of a young girl who is allergic to boys and breaks out into horrible hives whenever she touches one. This one-shot also sees the return of two ninja characters from Temari Matsumoto’s Shinobu Kokoro (previously released by BLU). It was also noted that if the Fruits Basket Ultimate Editions show continued popularity and sales, that all future volumes could continue as hardcover editions. Q: Any Yuri titles coming out? – “Not specifically but we’ve gotten requests to do a Yuri-specific line in the past… we don’t intend to have one but we’re not trying to be judgmental about Yuri.” Tokyopop staffers also noted that many of their series have Yuri attributes already. Q: Why is manga more expensive? “…hopefully there won’t be any more price increases… we realize that this is a kind of luxury item for people…” A neat fact staffers shared was that but once titles break the $10 mark on Amazon, you’re actually getting it cheaper than before because of the price break cut. Convenient! Q: What happened to Kampai volume 3? Q: Why did it take so long to license M&N? This title was actually licensed almost two years but only recently placed in the release schedule. Q: Any new volumes of Genju no Seiza coming out? Q: If Maria Holic is not yuri, what do you call it? Q: What do you think will be the next shoujo hit? Q: Any future plans for Sailor Moon? Q: What’s your next mahnwa release? Why do you think they’re not as popular? 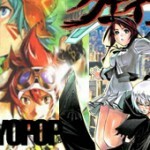 Q: Are there any plans for a new Tokyopop.com for those who don’t like how it is now? “Yes… and no…” Tokyopop is gradually trying to refocus the website but it’s a very complicated website that’s expensive to fix. They highly suggest that those who want manga-centric news sign up for the newsletter. Q: Any plans to license Battle Royale‘s sequel, Requiem? They admitted they haven’t heard of Battle Royale‘s sequel series before but do admit they’re currently looking into some of the artist’s newer series. They’ll definitely take Battle Royale‘s sequel into consideration and remind readers that they’re always listening to fans about possible licenses. Q: What happened to Tokyopop’s pilot program? “The pilot program was something that we did very briefly in 2008; we were basically commissioning chapters for OEL and original manga…” Tokyopop would then post the chapters online and look to reader-votes for ideas of what series would be most successful in full runs. Unfortunately the project fell through on the eve of its success due to the Tokyopop restructuring when there just wasn’t enough manpower at the company anymore. Q: How do you decide what to preview as online manga? 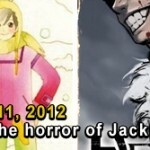 Tokyopop is currently focusing on new releases as promotion when deciding what preview chapters will be posted online. They would like more series to have online previews but it requires special permission from the original owners of the properties. Q: Will Tokyopop license the newest .hack manga? Q: Will you be releasing more OEL series with Harper Collins? “Yes, they’ve been really successful… it’s been great working with Harper Collins.” Warriors and Vampire Kisses are two examples of Tokyopop’s most popular Harper Collins series. Q: What con will you be at next? The next anime convention that Tokyopop staff will be attending is the upcoming New York Anime Fest in September. Q: Will you be publishing more full colour graphic novels? Tokyopop says yes and that the next book is another by Benjamin (artist of Orange). The book is titled Remember and is tentatively scheduled for early 2010. Q: Will you be joining the (Tokyopop) forums? “Hi moderator, thanks for stopping by! …I think all of us have profiles on the forums but most of us don’t really follow them…. we’re very busy.” They do say they’d like to be more involved however and plan to be as the schedule allows a little more flexible time in the near future. Q: As publishers, did the fall of Shoujo Beat magazine startle you? Q: When is RePlay 3 coming out? Q: How does the internship program work? What is the acception rate? The chance of getting accepted is apparently very high. If you’ve managed to make it into college and 18, you’re in a pretty good position, they say. “Interns are always a very integral part of our group.” They’re always looking for diverse, talented people to be a part of the team and earn class credits while gaining the experience. Phew, and that about wrapped it up! Another thanks to Tokyopop for hosting the short but informative event. Fingers crossed I’ll be able to attend the next one, which I do believe is still date/time pending. Bonus: As a screensaver-esque waiting room, they also played a fun trailer for the upcoming Domo graphic novel. You can watch it over on YouTube. I wish I would have been able to see more than the last ten minutes of this, but I had to work. I get a little alarmed seeing all of the new series on the release list. One of my faves – Nosatsu Junkie – was dropped, and it will take some time before I trust TP not to do that again. I wish they would finish releasing what they started. They could offer some of the less popular series as ebooks. I don't blame you on the worry over Tokyopop's recent history with dropping series. I was glad to hear during the webinar that they feel they're in a stronger position for releases right now but the concern remains. I asked the question about Genju no Seiza, one of my favourite series they're currently (or were currently) releasing. I've got my fingers crossed it comes back though regret we can't get our hopes too high about anything that doesn't at least poke near the bestsellers' lists. I loved hearing them talk about the new and upcoming series—it was fun and made a few titles I didn't have an interest in seem worth checking out! The preview pages from M & N cracked me up. Yes, Lissa, thanks for doing this writeup! Great job catching all those quotes! "Unfortunately the project fell through on the eve of its success due to the Tokyopop restructuring when there just wasn’t enough manpower at the company anymore." That's a nice way of saying 'criticism of the concept killed the Pilot Progam.' I was a little annoyed that many comments on those projects seemed geared at scolding the company for being so uncool about the contracts. :/ It seemed like they were ragging on the artists in lieu of being able to rag on the company face-to-face. I really wanted to attend this, but was unable due to work. But, I hope that there are other licenses that they'll be in the stronger position to bring back, like Suppli. I've loved that manga from the start and even went so far as to watch the entire Japanese drama based on it when it began to lapse. Unfortunately, the drama took a LOT of creative license and so I still want to read the rest of this series! "Trinity Blood: Reborn on the Mars (Vol. 03) – 11/3/09"
Oh gosh, I'm sooooo glad you posted this, since I wasn't able to make the webinar and didn't think they would even mention the Trinity Blood novels anymore (since they have a habit of just kind of ignoring series they've dropped, which I thought they were). Oh, thanks for asking the question about Genju no Seiza!! I've been checking for -any- information on its status for too many months now. Its by far one of my favourite series and I hate the cliffhanger its left off at in volume 7. Good to hear at least some recent-ish info on it! You're most welcome – it was the number one question I wanted to ask since Genju no Seiza is one of my favourite series. I really appreciated their honest answer, even if it doesn't bode terribly well for us fans. Fingers crossed though!